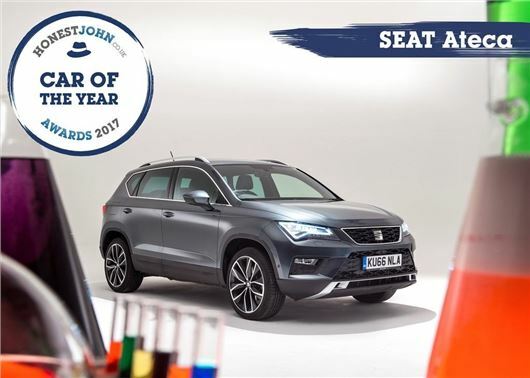 The SEAT Ateca is the Honest John Car of the Year 2017. It took the plaudits after it proved to be the most popular car with HonestJohn.co.uk readers over the past 12 months. As well as taking the ultimate Car of the Year prize, the Ateca also claimed the hotly contested Most Popular Crossover Award, reinforcing its status as one of Britain's favourite new cars. “We had to wait a long time for SEAT’s first crossover, but the good looking and affordable Ateca is proof that good things do indeed come to those who wait," said Dan Powell, Managing Editor of HonestJohn.co.uk. Everyone seems to be fooled by the base price but by the time it is specified up it is only a good deal compared with its cousin VAGs Tiguan. Although most SUVs are bought as 4x2 drive it should not be an excuse to down grade the chassis which is what SEAT have done using a cheaper less effective torsion beam rear suspension. I can support that it has a poor chassis. I was in the back of one last weekend around town and the suspension was rock hard. Almost hit the roof over one speed bump. I find the the suspension in the rear seat of a friend's new Seat Leon estate uncomfortably harsh. Otherwise a great car. Perhaps it's just the way Seat chooses to set their cars up. I came close to ordering one but was quoted 22 weeks for delivery of a 1.4 petrol and the dealer couldn't guarantee this. He also said the £1000 discount would only "probably" be honoured because delivery would be outside its validity date. There seems to be an over supply of diesel models which my mileage doesn't warrant. I was rather annoyed by the way SEAT package extras so that to get one thing which I want I have to take two other things I don't want so I took my custom elsewhere. Sorry SEAT, you'll have to do better. Shame because in many respects it seems a good car. I suppose the SEAT being a Spanish firm originally but now under VW management they are between the devil and deep blue sea. I am sure the Spanish management will package differently were it not for the VW directives. who after all finance all their activities.I must say I do not have any complaints against Honest John and I think they provide an excellent service and long may it continue. What I would like to know is what is the criteria for the Car of the Year and are you i.e. Honest John the chief judge of the honour? I was under the impression that The Society of Motor Manufacturers and Users is the authority of awarding this honour to any particular make of car. In my opinion Mercedes Benz E Class is a far better car than the SEAT model which you have declared the winner.